Semester exams will be held the week of January 9, 2017. The full schedule is available by clicking here. We have spaced exams out over the week so that students have plenty of time to study without needing to either cram or stay up too late at night. Most students in grades 9 and 10 will have 2-3 exams, spaced out over four days. Friday will be the make-up day for all grades. Students in grades 11 and 12 will have 3 – 5 exams, depending on their course load. Grades 9-10 will also have 2-3 exams in the spring, and students in grades 11 and 12 will have no exams in the spring. The week we return from Winter Break will be devoted largely to review, and students will be given the appropriate review materials and they will go over the format of each exam. You might, over the break, help your child create a study plan for the week we return and then for exam week. That can be calming for students to know how they will manage their review and exam preparation. Feel free to be in touch if you have any questions about exam prep. We are aware of some exam conflicts, and those students have been assigned a different time for one of their tests. If you see a conflict that has not been addressed, please let your dean know right away. Buses will run on the normal schedule from January 9 – 13, both in the morning and afternoon. Students need to be in school only for their exam, so they may leave school after their morning exams on any day or come to school in time for their afternoon exams. Students must provide their own transportation if they intend to travel outside of the bus times. The Library and COOP will operate on normal schedules January 9 – 13. Lunch will be available from 12 PM – 1:00 PM on January 9 – 13. Students are not allowed to enter the dining room during middle school lunch, which means before 12:00 noon. Don’t start test prep too early: in most cases, the fall/winter of junior year is the right time, in order to plan for tests to be taken toward the end of junior year (when most college admission testing is done). Make a plan, and be efficient with time spent on test prep: you want your student to spend the time on test prep that is needed to do his/her best, but not a second more than that. There are close to 900 colleges — including selective and highly selective schools — that have either test-flexible or test-optional policies, giving students the chance to apply to colleges without submitting standardized test scores. Beware of test burn-out, which typically happens when a child begins prep and/or official testing too early in the process. The goal is for the student to “peak” (i.e. be able to earn their best-possible scores) either by the end of junior year or beginning of senior year. It is rare for a student to be able to peak early in the junior year (or before), so it is counterproductive to start the testing calendar for the student too soon, and can even lead to declining scores later on. The most important part of a college application will always be the transcript, not the test scores. While scores play a role, a student’s record over their years of high school matter most in college admissions decisions. This year, President Obama named November National College Application Month; and it certainly felt that way! Most of our seniors applied to at least one college in November, either through a non-binding Early Action or Rolling plan, or through an Early Decision (binding) plan. Every year we do have students who do not apply early in any way, and that can be a very well-thought-out plan for those students, but the majority are sending in applications early. Seniors are now hearing results from those early applications, and by the end of this week most early decision and early action schools will have reported results. That makes for an emotional few days, where seniors are faced with a complex moment of balancing their reactions to news about themselves with their reactions to the news of close friends and other members of the class. At this point in the year some seniors are finished with the process and know where they are headed in the fall and the rest are applying to schools with January deadlines, and the process will continue into the spring, with a final May 1 deadline for seniors to decide on their next step. As the CCO continues to work with seniors, we also look forward to beginning our work with the Class of 2018! Much more information about that will be forthcoming in the next few weeks. In the meantime, we wish all of our Seniors good luck. 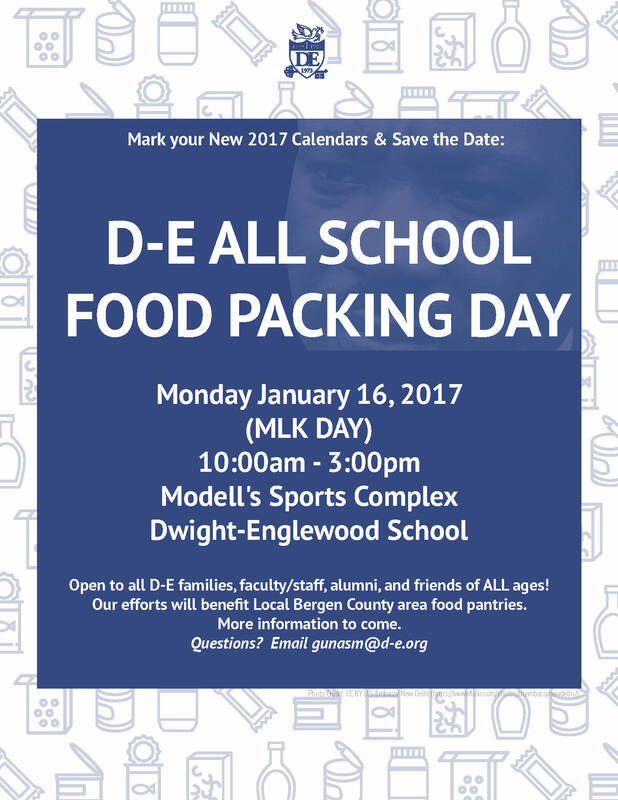 D-E will be hosting an All-School Food Packing Day at Modell’s Sports Complex, to benefit a local Bergen County food pantry. Typically our sports teams and clubs come together to help out, and this is a fun and worthwhile community-building event for D-E families of all ages. For more details, including volunteer sign-up information, click here or go to https://www.d-e.org/page/news-detail?pk=861071&fromId=198817 . If you have questions please email Director of Student Activities Maya Gunaseharan at: gunasm@d-e.org.